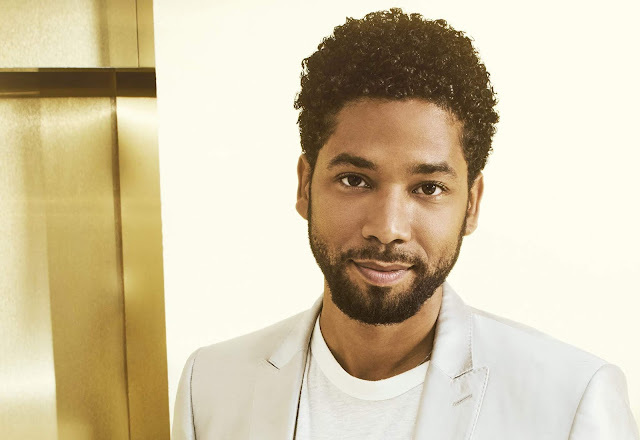 TV with Thinus: Jussie Smollett of Empire on FOX brutally attacked in possible hate crime in Chicago; attacked with racial, homophobic slurs, punched, drenched in chemicals and rope tied around his neck. Jussie Smollett of Empire on FOX brutally attacked in possible hate crime in Chicago; attacked with racial, homophobic slurs, punched, drenched in chemicals and rope tied around his neck. A star of Empire seen on FOX (DStv 125 / StarSat 131 / Cell C black 201), Jussie Smollett, was brutally attacked in Chicago on Tuesday morning, according to multiple reports in American media, in what purports to be a hate crime in which racial and homophobic slurs were hurled at him while he was punched, chemicals poured over him and a rope tied around his neck. The Chicago police department in a statement on Twitter said that "The Chicago police department received a report of a possible racially charged assault and battery against a cast member of the television show Empire". "Given the severity of the allegations, we are taking this investigation very seriously and treating it as a possible hate crime." Jussie Smollett of Empire who visited South Africa in December 2017 and who appears as the gay musician character of Jamal Lyon, the son of Lucious (Terrence Howard) and Cookie (Taraji P. Henson), walked out of a restaurant in East Lower Water Street in Chicago at 02:00 on Tuesday morning when two attackers started hurling racial and homophobic slurs at him. They then brutally physically attacked him, punching him, before pouring an unknown chemical substance over him. One of the attackers also wrapped a rope around Jussie Smollett's neck, after which they fled the scene. According to TMZ the two offenders are allegedly white men and wore ski masks, with one that allegedly yelled: "Aren't you that f***ot Empire n*****?" Jussie Smollett drove himself to a hospital. 20th Century Fox Television in a statement late on Tuesday said: "We are deeply saddened and outraged to learn that a member of our Empire family, Jussie Smollett was viciously attacked last night". "We send our love to Jussie, who is resilient and strong, and we will work with law enforcement to bring these perpetrators to justice. The entire studio, network and production stands united in the face of any despicable act of violence and hate - especially against one of our own." Lee Daniels, Empire co-creator, in a statement says "Jussie you are my son. You didn't deserve, nor anyone deserves, to have a noose put around your neck; to have bleach thrown on you. You are better than that. We are better than that. America is better than that. It starts at home. We have to love each other regardless of of what sexual orientation we are."